When supply is plentiful, the buyer has more power than the seller. That’s certainly true in the escalating trade war between the U.S. and China. And a trade confrontation already exists so the important question is, will it escalate to the level of disrupting significantly the economies of America and China—and, indeed, the world? 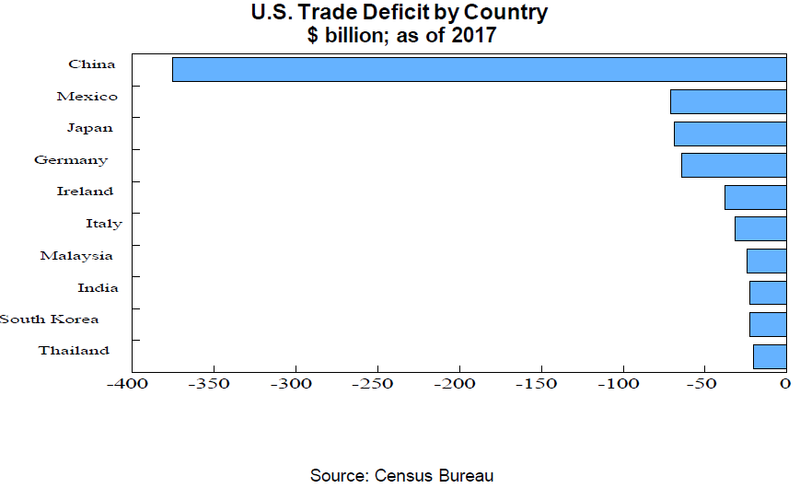 The U.S. trade deficit with China was $375 billion last year, or 62% of the total American international trade shortfall. And the deficit with China has grown chronically and rapidly from $10.4 billion in 1990. In the first two months of this year, the U.S. trade deficit with China was $65 billion, up from $54 billion a year earlier. On the surface, 21% of Chinese exports go to the U.S. vs. 50% that are bound for Asia (Chart 2). But many of the latter products are processed in other Asian countries before being shipped to the U.S. We estimate that the American imports that originate in China are two to three times the size of those shipped directly, so about half of Chinese exports end up in the U.S.
Chinese exports account for about 20% of GDP and direct exports to the U.S. total 4.3% of total economic output. In contrast, exports from the U.S. equal 12% of GDP and exports to China equaled 0.8% of GDP last year. So those exports are almost twice as important to the Chinese economy as exports are to America’s. 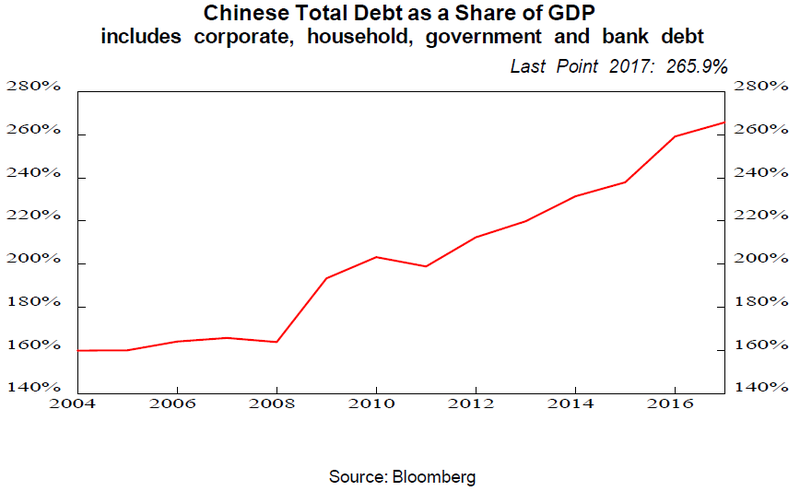 Even more so since the only other major driver of Chinese growth is infrastructure spending, which results in excess capacity, ghost cities and huge debt (Chart 4). Unfortunately, China has no other viable export markets in which to sell all those electronic gadgets, clothing and flatscreen TVs that American consumers love to buy. Also, changing spending patterns present a long-term problem for China’s export emphasis on goods. As economies develop, they become more oriented toward consumption of services and less on goods, as we’ve noted repeatedly in past Insights. This is true of the U.S. where just one-third of consumer spending is on goods while services have climbed to two-thirds. 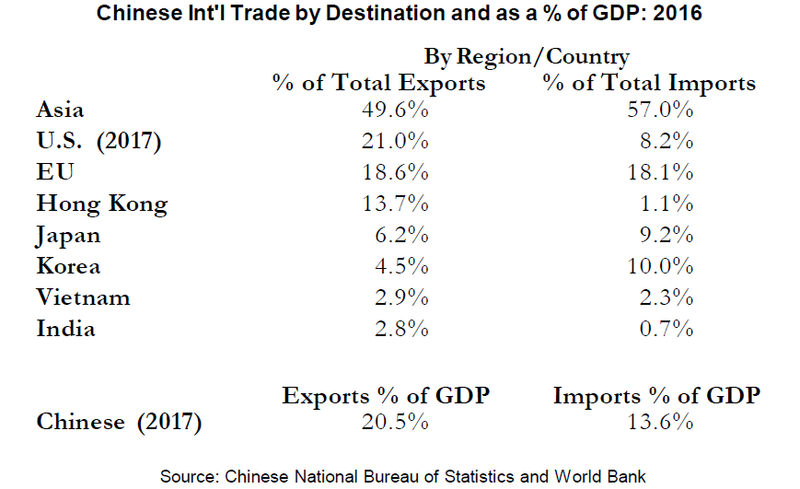 It’s also true of China, but at her early stage of economic development, goods, many of which are exported, still account for 41% of total output. The levies Trump proposed are also aimed at China’s targeted industries for future growth under its “Made in China” 2025 industrial plan. These include large aircraft, electric vehicles and robots. 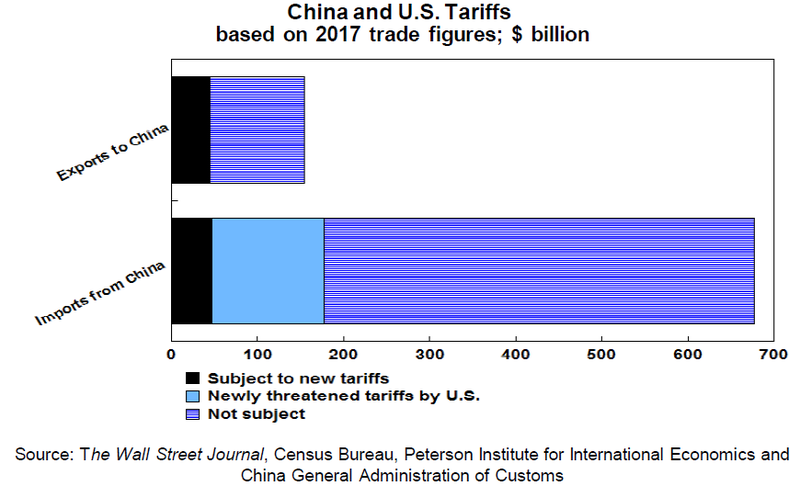 The $50 billion planned U.S. tariffs on Chinese goods amount to 4.3% of Chinese GDP, but China’s $46 billion retaliation is just 0.2% of U.S. GDP. To read the rest of Gary Shilling's May INSIGHT newsletter, click here for subscription information. Each issue includes an extensive overview of the economy, exhaustive investigations of key economic indicators and how they affect your investment portfolio, detailed examinations of emerging business and financial trends that could spell opportunity or danger to you and your investments, our investment themes, a wrap-up of recent economic data, and Gary Shilling’s back-page Commentary on matters great and small. You can also follow Gary on Twitter @agaryshilling.